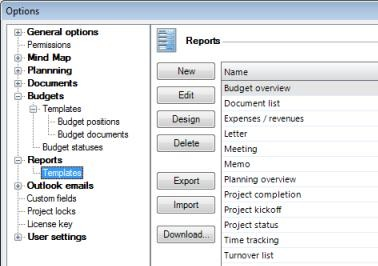 You can customize the report templates as you want in the InLoox PM options. InLoox PM 7 provides you with such different templates like schedule, budget overview, plan-actual comparison, cross-projects time sheets, memos, status report, cover letter, billing and offer templates. From the first moment you have the right tool for your project daily routine. Define also for which project page this report template will be created. Select the corresponding check box in the Show as quickreport in area. Click OK.
Change the existing template. Choose one from the list and click Edit. In the Report dialog box make the changes you want as it is described in the first point. Change the template content by clicking Design. In the InLoox PM Report Design dialog box make the changes you want. Load e template from your local data, which you have received from other users. Click Import and choose a template in the Open Report Template dialog box, and then click Open. Click Download to download the report templates from our website. How to edit the report templates in InLoox PM 7 • Copyright 1999-2019 © InLoox, Inc. All rights reserved.